Rescuing one animal may not change the world, but for that animal, their world is changed forever. 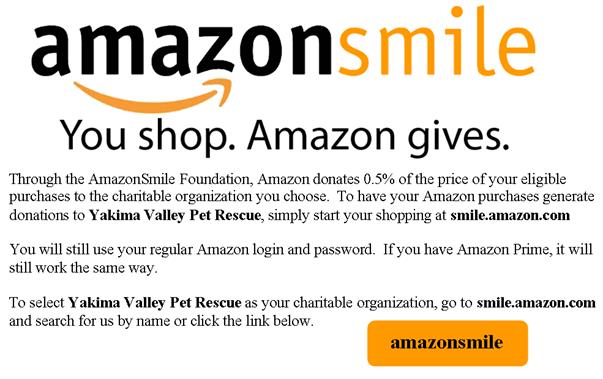 Yakima Valley Pet Rescue is a 501(c)(3) non-profit organization dedicated to the rescue, care, and adoption of unwanted, neglected, or death row dogs and cats. We also provide assistance to families who can no longer care for their pet, or who find a stray they cannot keep, or by providing less expensive spay/neuter and vaccination alternatives. In addition, we provide pet owner and spay/neuter education through our many events around the valley and state. We believe that prevention of unwanted puppies and kittens is the most critical way to reduce the number of animals that suffer hunger and neglect, or that die in shelters. PLEASE have your pet spayed or neutered to help solve the pet overpopulation crisis in Eastern Washington! Promote the welfare of all pets, to eliminate their suffering, and act as an extension of the education of the humane treatment of pets. Perform whatever duties possible in an effort to provide humane care and treatment for unwanted and displaced pets. Return lost pets to their owners whenever possible. Protect and place as many healthy, temperamentally sound pets in homes where they will receive quality, lifelong care. Provide a second chance at life to those pets who are neglected, on death row at animal shelters, or can no longer be cared for by their owner. Partner with all legitimate rescue resources, individuals, and organizations, in an effort to place pets in homes where they will receive quality, lifelong care. Yakima Valley Pet Rescue invites you to our Board Meetings held the first Thursday of each month at 6:30pm at our office at 1009 Fruitvale Blvd, Yakima, WA. 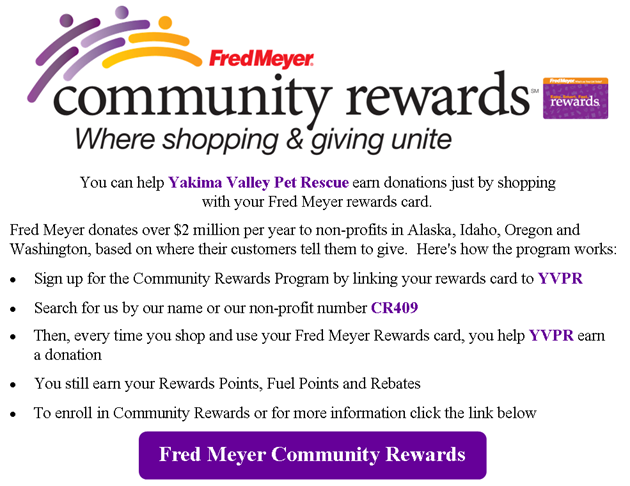 Support YVPR Every Time You Shop!